The 2019 U.S. Houzz Kitchen Trends Study found that reported spending on both median and large kitchen remodels increased 10 percent from last year. National median spend on kitchens overall reached $11,000 in the last year, while the median spend on kitchens over 200 square feet hit $33,000. Houzz’s annual study, which surveyed 1,300 U.S. homeowners who are in the midst of, are planning, or recently completed a kitchen project, also found that only 35 percent of renovations enlarged the kitchen, compared to 41 percent in 2018. Eighty-three percent of respondents hired a professional for their project, including general contractors (50 percent) and kitchen designers (20 percent). Houzz also found that motivations behind remodels are shifting. Over the past three years, the number of homeowners remodeling because they can “no longer stand the old kitchen” or because they “finally have the means” have both decreased (to 34 percent and 33 percent respectively), indicating less pent-up renovation needs. Meanwhile, the share of homeowners remodeling to personalize a recent home purchase remained steady, at around 30 percent. Though not as popular as in baths, many Baby Boomer homeowners are looking to remodel their kitchens for current or future aging needs (28 percent and 10 percent, respectively). Sixty-nine percent of baby boomers plan to stay in their current home for 10 years or longer. Meanwhile, 21 percent of younger generations are also renovating their homes with current and future accessibility in mind. Planning for accessibility makes homeowners more likely to open up the kitchen to other rooms or make them larger, as well as more likely to hire a professional remodeler or designer. Remodeling homeowners are most likely to swap out countertops (93 percent), all or some appliances (88 percent), backsplashes (87 percent), sinks (85 percent), faucets and fixtures (83 percent), lighting (80 percent), and cabinetry (78 percent). Technology drove some product categories, with 57 percent of those who upgraded their faucets and 30 percent of those who upgraded appliances choosing high-tech replacements. Transitional is still the most popular style for those changing the look of their kitchens, at 21 percent. But for the first time, farmhouse style nearly tied with contemporary for second place (14 and 15 percent respectively). Farmhouse style has seen consistent gains over the last three years, while contemporary has steadily declined. Homeowners are also getting more creative with finishes, as more than half (54 percent) report mixing metals in their kitchen this year. All homeowners favored brushed or satin nickel, but those who mixed finishes also opted for oil-rubbed bronze or brushed or satin black. Stainless steel remained the leader for appliance finishes (69 percent), but black stainless gained in popularity (to 10 percent from 7 percent in 2017). 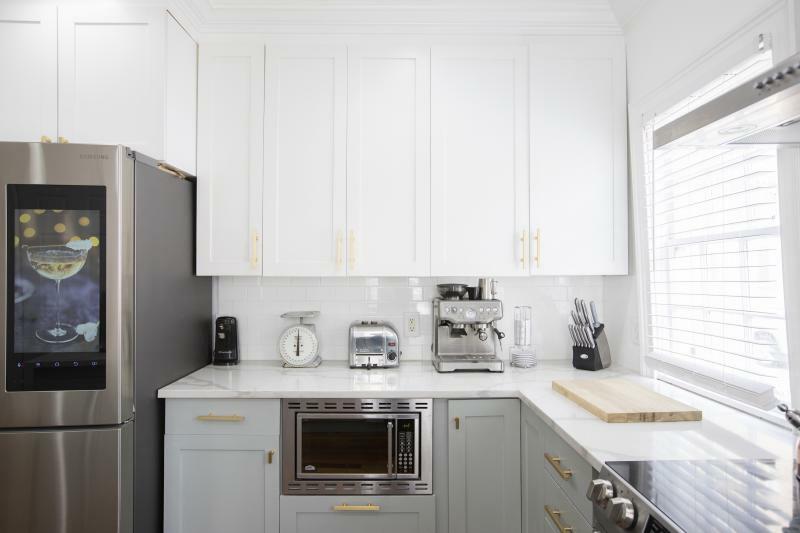 White and wood cabinetry dominated (43 and 25 percent, respectively), but gray is making inroads: 11 percent of homeowners report using gray cabinetry in the 2019 study, up from 8 percent in 2017. White is also the most popular color for countertops (31 percent) and backsplashes (35 percent), while gray is popular for walls (31 percent). Rounding out product choices, shaker style dominated cabinet doors (57 percent), engineered quartz overtook natural stone for countertop choices (48 percent and 43 percent, respectively), and ceramic and porcelain tile topped material choices for both backsplashes (55 percent) and flooring (26 percent). Hardwood flooring has seen an eight-point decrease since 2017, to 24 percent, while its engineered look-alikes have made gains. See the full results of the 2019 U.S. Houzz Kitchen Trends Study here.